Liebherr UWTes 1672 at the LOWEST PRICE in UK! Liebherr wine cabinets to be the LOWEST PRICE in the UK! For the LOWEST PRICE in UK! Your Liebherr UWTes 1672 Vinidor is guaranteed to be the lowest price in the UK. The price includes delivery and a digital hydrometer. The UWTes 1672 has a stainless steel frame with an insulated door. It has a storage capacity of 34 bottles comprised of 2 independent zones. Of it's type the Liebherr UWTes 1672 Vinidor is the most energy efficient with an B energy rating. Have you seen a lower price from a Liebherr dealer in the UK? Let us know where from and we will beat it! Request a Quotation? Call 020 3318 46 91 or mail. Comparing online prices you will find out that Cavepromotor has the best prices in The UK. The Cavepromotor origins are in the wine industry, therefore we are continuously concerned about the perfect storage and serving of your wines. To control the level of humidity, Cavepromotor includes a digital hygrometer. So while comparing be aware that you compare 'apples to apples'. In addition, and as part of our service strategy, our wine Specialists are available with advise and best practice information, before and after your wine cabinet purchase. 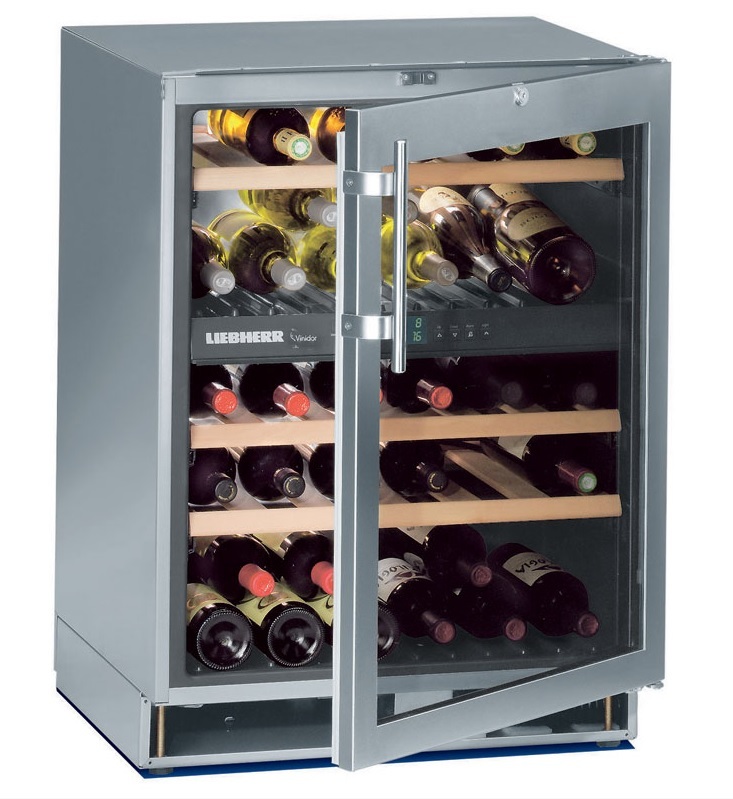 Liebherr wine cabinets & fridges are the only manufacturer Cavepromotor sell and because of this we can purchase the Liebherr UWTes 1672 for the very best price. Also Cavepromotor does not pay for any additional marketing or to any of the online comparison sites. The digital hygrometer helps you to monitor the humidity level inside your wine cabinet. What would be the ideal level of humidity? Different wine experts share different opinions. To be on the safe side we at Cavepromotor recommend a range between 50% and 75%. Keeping the level too low will affect the cork, too high will result in moulded labels. Every wine cabinet has a climate indication and for the Liebherr UWTes 1672 Vinidor it is: SN-ST. If you have any questions regarding the temperature settings which are not covered in the instruction manual please contact us directly. Our wine specialist are available to help with any queries relating to your Liebherr UWTes 1672 Vinidor.